The hobbies and interests section is an important but optional section in your CV. Many candidates do include it in their CVs, whereas others don’t. Which is approach should you take? We recommend including your personal interests on your CV because it is a great way to stand out from the crowd, show the prospective employer a bit of your personality and make it a basis for conversion at the job interview. Examples of many hobbies + how to add them to your CV. 1. What are hobbies and interests? A hobby is an activity that you pursue regularly for enjoyment purposes, particularly during your leisure time. These are activities that generally relieve you from stress, tension or fatigue, for example; playing sports, solving puzzles or writing content for your personal blog. An interest is an activity that you want to do or are currently doing on an irregular basis. For example, wanting to help in your community or joining an animal rights group. Recruiters invest in people; they hire and work with human beings, not robots or minions. Consequently, recruiters look for every clue on the candidates’ CVs to find out about their true interests, skills and competencies. ‘Playing football’, ‘solving puzzles’, and ‘fixing computers’ are not generic terms without any meaning, rather; they carry a deeper message. What does “I play football on a regular basis” tell me about this candidate? What does “I enjoy solving puzzles” tell me about this candidate? What does “I like fixing computers” tell me about this candidate? These are the type of questions that the prospective employers will be asking subconsciously when reading through the candidates’ CVs. Ask yourself: how do these interests add value to my application? Try to highlight your ability to interact, help and/or communicate with others. 4. Who should write hobbies and interests on their CVs? The reason for this is because your CV is your personal marketing tool and you should make the most out of using the totality of your CV, including the interests section, to “sell yourself” to the prospective employer. Due to the lack of valuable space on these candidates’ CVs, relevant work experience and qualifications take a higher priority over personal interests. Now, let’s get down to writing it. There are thousands of hobbies and interests that people include on their CVs. Selecting the correct hobbies to include will depend on a number of factors, including the job sector and the job role/specifications. Don’t list down your interest – describe them in sentences! So… what interests should you put on your CV? Answer: Those that are relevant and add value to your application! The rule of thumb is only to include activities that contribute to and strengthen the application. If you cannot draw this valid connection then do not include those activities. Bain activities (such as playing chess) are a good match for jobs which are technical or analytical in nature (e.g. jobs in IT or Science). Team sports (such as playing football) are a good match for jobs which require working with people on a daily basis (e.g. jobs in Business or Marketing). Different activities can be interpreted differently depending on the job you are applying for. For example, “playing computer games” as a hobby is irrelevant to most jobs and may sometimes portray you as a self-absorbed individual living in their own little cyber world. However, the same hobby can add tremendous weight to your CV if you apply for a job as a video game developer, graphics designer or as a shop assistant at your local games shop! Check out the job specification and look for clues. For example, if the job holder “must have excellent people skills”, you could mention your volunteering, team sports or socialising activities – all of which develop your communication, interpersonal and people skills. Don’t mention playing chess or jogging as that would be irrelevant. If, on the other hand, the job specification states that the person “must possess outstanding technical skills”, you would mention playing chess, building computers and upgrading computer networks – things that indicate that you are technically-competent and analytical minded. Don’t mention socialising events because that would be less relevant. Many companies have a ‘culture’ in the way they operated and how employees of that organisation behave. Google, for instance, is now famously known for allowing employees to play games, take a walk or do sports in order to relieve stress or become more productive during working hours. When applying for a job at a company like Google, there is no harm in showing a little bit of your fun, playful and human side because that fits in nicely with their company culture. It is always a good idea to write down the list of skills and abilities that you possess and see which of these would add value if you include it in your CV. Skills and abilities are closely related to your hobbies and interest, therefore, you may include them in this section too. However, not every one of the above categories may be suitable for your situation and the job that you are applying for. To get a better idea of which hobbies would be suitable for which jobs, we have developed lists of key job sectors below with their relevant hobbies. 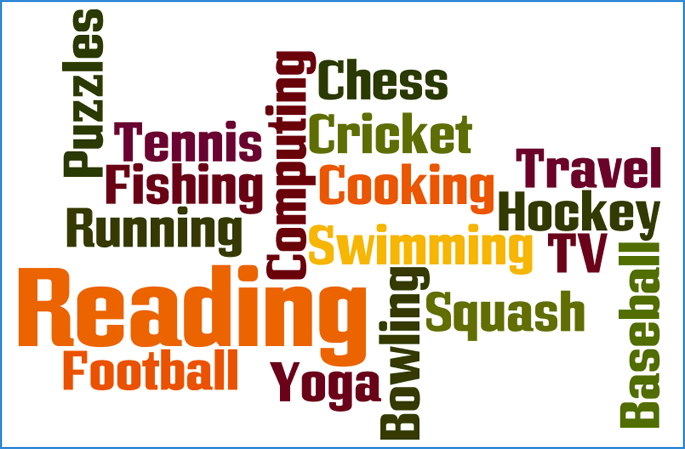 The lists contain many examples of good hobbies to include on your CV, depending on your job. Please note that these lists are not exhaustive and is only intended for illustrative purposes. Roles: Business advisor, manager, supervisor, marketing consultant, etc. Jobs: web developer, network engineer, first-line support, IT manager, etc. Jobs: sales representative, customer service advisor, shop assistant, etc. Jobs: graphic designer, photographer, artist, etc. Jobs: recycling officer, environmental consultant, activist, etc. Jobs: catering assistant, chef, cook, etc. Jobs: admin, librarian, information officer, etc. Note: The example below is a bit long because the candidate had empty space in their CV and utilised it accordingly. Remember: This section is optional so placing it higher up on your CV will give the prospective employer the impression that you do not understand how to prioritise things. Think about it, how can your personal interests be more important to the employer than you work experience or qualifications? It is best to avoid putting anything controversial or sensitive on your CV. Humans are by their nature very judgemental, so be wise about what you disclose on your CV. For example, some recruiters may judge you negatively if you included heavy metal as your favourite music genre. Stating that you are an “active member of the local church” may harm your chances of being invited to an interview, especially when the potential employer reading your CV is a strict atheist. Similarly, stating that you “volunteered on a number of Labour election campaigns” or that you are a “huge fan of Manchester United” is also not very good ideas. It is in the employer’s best interest to have you healthy, fit and able to work. Any leisure activities that put your life at risk (or are too time-consuming) will be looked unfavourably upon. Therefore, please remove “regular rock climbing in the Himalayas” as one of your hobbies from your CV. Thanks. Only make mention of your personal interests if they add value to your application. What value does “Stamp and coin collecting” as a hobby to the application of someone who applies for the Logistics Engineering Manager position? The answer: none. However, stamp collecting would be a very valuable hobby to mention when applying for a job as a Stamp Appraiser. Managers, executives and directors should entirely omit this section of their CVs. Their personal interests should be clear from their achievements and experiences in the workforce. Remember that whatever you put on your CV, including your personal interests, may be asked about and scrutinised at the interview stage. Save yourself the embarrassment and do not lie about your hobbies. 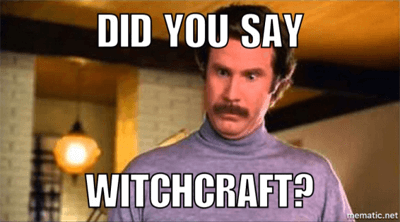 Performing witchcraft and frog dissections for fun shouldn’t be the hobbies of anyone, let alone mentioning it on your professional CV! You should now know how to write the hobbies and interests section of your CV like a pro! Need any help on other parts of your CV or looking for a template? Check out Download CV templates (Word) and How to write a CV (guide) where you will find more tips, information and examples.